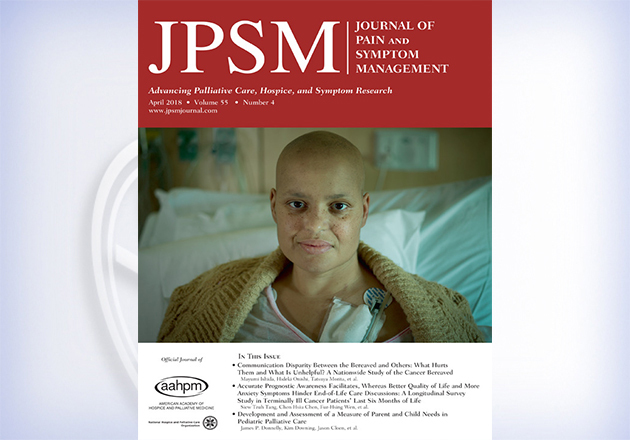 The Journal of Pain and Symptom Management is the official professional journal of National Hospice and Palliative Care Organization. 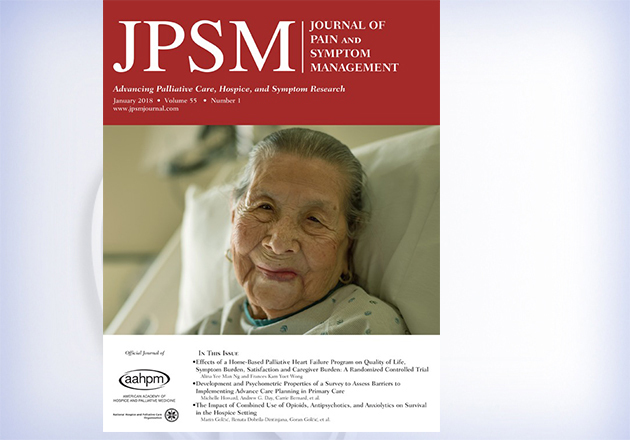 JPSM, published by Elsevier, is a highly respected journal in the field of hospice and palliative care with a readership that increasingly extends to the broader medical community. Lisa C. Lindley, Elspeth M. Slayter. Kristof Faes, Joachim Cohen, Lieven Annemans. Hanna T. Klop, Sophie I. van Dongen, Anneke L. Francke, Anke J.E. de Veer, Judith A.C. Rietjens, Jaap R.G. Gootjes, Bregje D. Onwuteaka-Philipsen. Kirsten Wentlandt, Philippe Toupin, Natalia Novosedlik, Lisa W. Le, Camilla Zimmermann, Ebru Kaya. Sujin Ann-Yi, Eduardo Bruera, Jimin Wu, Diane D. Liu, Monica Agosta, Janet L. Williams, Vishidha Reddy Balankari, Cindy L. Carmack. Komal P. Singh, Kord M. Kober, Anand A. Dhruva, Elena Flowers, Steve M. Paul, Marilyn J. Hammer, Frances Cartwright, Fay Wright, Yvette P. Conley, Jon D. Levine, Christine Miaskowski. Joseph Clark, Amy Barnes, Clare Gardiner. Elise C. Carey, Miguel Paniagua, Laura J. Morrison, Stacie K. Levine, Jeffrey C. Klick, Gary T. Buckholz, Joseph Rotella, Julie Bruno, Solomon Liao, Robert M. Arnold. This is only part of the September 2018 content. 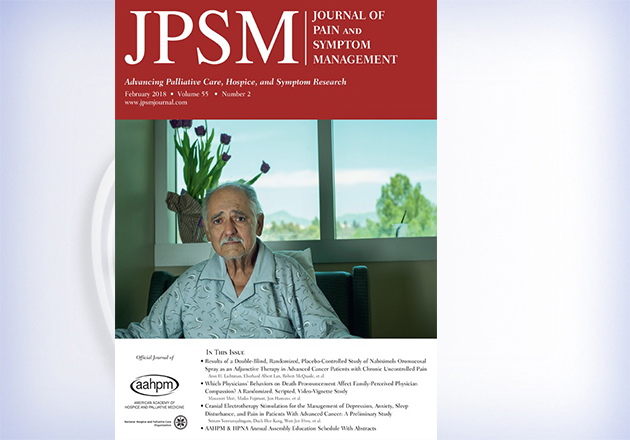 Review the full table of contents on the JPSM website. 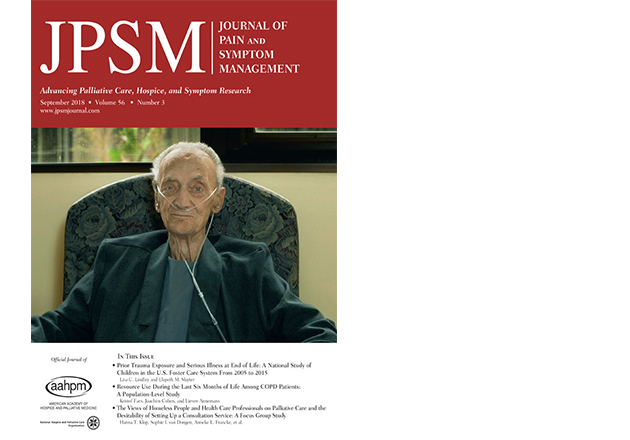 NHPCO members may subscribe to JPSM at a significant discount. Download the order form.